It was 1910 when Chanel opened their hat boutique in Cambon Avenue. Chanel will have 100 years’ anniversary next year. We may say this 100 years is a golden age of fashion, and I think this 100 years will be over soon. The poor economy after 100 years, rapid spread of PC, and other interesting consumption facts e.g. beauty, are changing women’s life. All these facts such as hair dye, gel nail, eye-lash extension, facial care, fitness, anti-aging, travel to reward ourselves, need time and money. Fashion is no longer put in the first place and women are not able to spend so much money and time. Because of the concept of equality, it is no longer the time that guys will always pay for the date, so women are now not able to spend more money on fashion. Also modern arts, which used to be accessible only among jet-setters or fashion people, are now highly accessible through internet or museums by more people. 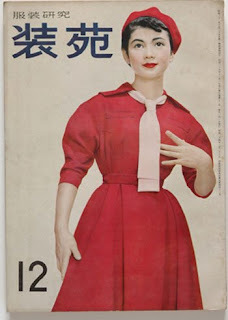 The big fashion houses sponsored modern arts, and many people came to know more about arts. Now more people can understand the real arts, so they don’t see surprises and rareness in fashion. Also we can check through internet, compare the prices and places, so people don’t have to do too much research. Eventually, we don’t have to go shopping around so often. I missed window shopping. It was 100 years that gave a huge influence but it is now that people can compare and check on internet about celebrities’ true attitude. Dress-down can’t be stopped. More and more young people have check through internet, they like and and copy super models’ clothing and attitude - wearing rough clothes, biting an apple, going through the show’s back-door. I was born in 1954 and lived with growing fashion for half a century. During those days, I wanted new clothes, bags and shoes. I went around shops as soon as I have time. It is now that I need to look back the time I have lived and watched carefully what is good in coming future. Milan Moda Donna is not quite smooth which will be held between February 25 and March 4. There are management people who acknowledge this bad situation of fashion mode and try to look for solution. Designers who have strong will to challenge fashion and suggest new trend always make their sponsors cry, there’s no answer to who is right. Fall-Winder Collection 2009-2010, I have many doubts but can’t find answers. As what I have done, I do my best on whatever it is in front of me and try to find joy and creativities in fashion. I do huge research and need to keep challenging in high speed. I know that new ideas and designs come out will not only stay in pre-a-port but also move into the new field and wishing that I can be a cultural bridge between Italy, Hong Kong and Japan and welcome the coming of the new 100 years.